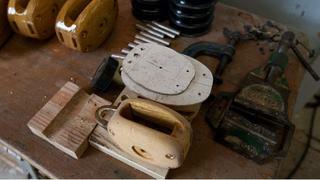 Maritime Enterprises also makes propellers, rudders, tillers, deck furniture and decorative castings. While the current technological climate delivers rapid advances in boatbuilding, sailmaking and rigging, both in terms of design and materials, is there a risk of losing the skills, accumulated knowledge and craftsmanship associated with traditional yachts? As this progress continues to accelerate, the design goal for modern cruising and racing yachts has always been the development of lighter, stronger, more efficient hardware and increasingly robust and exotic materials have fulfilled this objective. The exciting expansion of the J Class might provide a niche for traditional, bespoke hardware, although the intensity of race course competition within the fleet, combined with the immense power of the new yachts requires modern equipment. Thus, preserving these skills is the domain of classic boat owners, Spirit of Tradition yachtsmen, tall ship syndicates and enthusiasts brave enough to take on a restoration or build a faithful replica. Anyone fortunate enough to gaze across the decks or up through the spars of a traditional yacht moored stern-to during the Mediterranean classic regatta season cannot fail to be impressed by the amount of care that has been taken to conserve or restore these floating temples of hardwood. 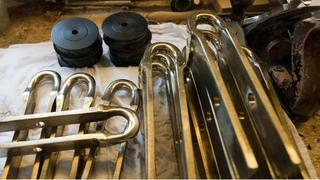 However, blocks shatter, masts break and bronze fittings eventually wear out and replacements need to be found. One source of new and entirely traditional bespoke hardware is Maritime Enterprises, a small business located in a collection of boat sheds in Yarmouth on the Isle of Wight. For these craftsmen, epoxy is a dirty word and electric hand tools are considered the Devil’s playthings. With 40 years in the wooden boatbuilding business Bob Snow, along with his wife and co-director Jan and three skilled craftsmen, produce spars, blocks and hardware that have gained international recognition. Their impressive recent client list includes Blue Bird, the gentleman’s motor yacht built in 1938 for Sir Malcolm Campbell before her re-launch in 2007; the 1920s masterpiece Lulworth; the William Fife-designed Altair; the Spanish royal yacht Hispania launched for King Alfonso XIII in 1909; and the Charles Nicholson-designed gaff cutter Merrymaid. After a high entry level into cabinet making during the early 1960s, Snow’s first commission was to design and make a baby’s backed stool as a christening present for Prince Andrew. But it wasn’t long before he transferred into the marine industry working for the late Harry Spencer at Spencer Rigging in Cowes. After time spent in Nigeria repairing wooden seismographic exploration boats frequently blown apart by dynamite, Snow settled in West Wight and began building handmade sailing boats. He also taught ocean navigation and held the position of second coxswain on one of the island’s lifeboats for 28 years. In 2003, the Snows bought Spencer’s block patterns and established Maritime Enterprises in Yarmouth.